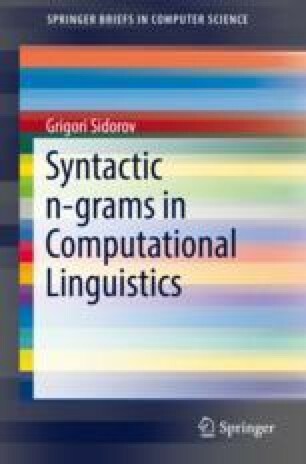 As we have already mentioned, the main idea of the formal features applicable in computational linguistics is related to the vector space model and the use of n-grams as features in this space, which also includes unigrams, i.e., words. The words are considered in the contexts. Usually, it is neighbor words. But some words that have syntactic relations are not neighbors, thus, here appears the idea to use syntactic information to obtain real (syntactically related) neigbors as the context of a word. So, we suggest obtaining n-grams by following paths in sytanctic trees.